Feel free to steal some of my tactics and approaches, but by NO MEANS do you have to do what I do to be a productive writer. Whew, glad we cleared that up. Now, let’s get to it. Then I turn on CBS News and get caught up on what’s happening in the world for 10-15 minutes while I eat, wake up, and check email on my phone. Now that I’m awake, I go into the office and check out my whiteboard and wall calendar to see what all I need to do today. I make a fresh list at the end of every day so I don’t forget anything important. 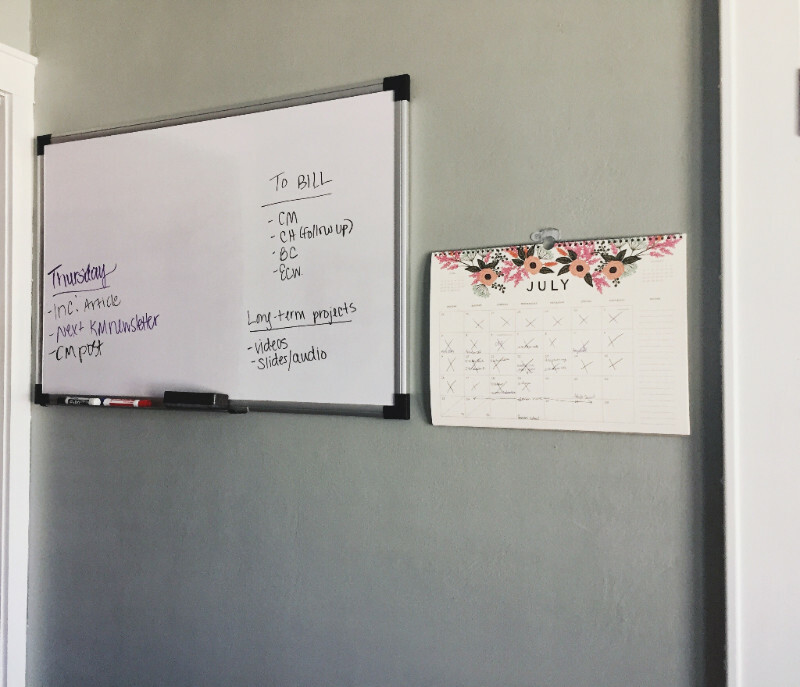 From there, I make another list in my steno notebook (on my desk) that’s prioritized based on what I need to accomplish and in what order. I LOVE LISTS. Then I plop down at my desk and start responding to emails first. There’s usually not a ton of catching up to do because most of my client work is laid out in advance on a content calendar (most use CoSchedule). For my coaching/mentoring work, I only work with 1-2 people at a time, so the workload is very manageable and focused. After that’s done, I focus in for my first writing sprint of the day. Most of the time I’m writing blog content for a client. If I’m writing a new post, I always start with an outline. Most of the companies I work with are into long-form content right now (1,000+ words), so most weeks my average word count is high. Here’s how I structure long-form content. As I write, I use my own version of the Pomodoro Technique, which means I write in uninterrupted sprints of 15-20 minutes at a time with a 3-5 minute break between each sprint. During breaks, I usually check in on Twitter as it’s basically my virtual office water cooler. I’m totally distracted by music/TV, so the house is completely silent for most of the workday--which is both eerie and somber but very much work-conducive for me. When I’m writing, I sit (I use a Herman Miller Aeron chair) and a large Mac monitor with split screens so I can see the doc I’m working on (in Google Docs) as well as whatever research I’m referencing on the other side. Around 10:00 each day I take Brooks (dog) for a mile to two-mile walk, unless it’s too hot out or raining. I live in the Midwest, so it’s right around the 90-degree mark right now and verrrry humid. BUT, it’s good exercise for both of us and keeps me from getting too stiff from sitting for extended periods. Sometimes I take a podcast to listen to, or sometimes I use this time to think over a piece I’m writing about. After our walk, my mind is clear and I can really focus on diving back into writing or researching. For about 90 minutes (this time with far fewer breaks), I’ll work on fleshing out an in-depth blog post, sourcing images, finding examples to reference, and looking at data I can leverage to make the post a worthwhile read. During the summer I like to eat out on our front porch in the shade and get some fresh air. It’s a good way to let my brain rest and recharge before jumping back in. If I'm not outside, I usually turn on an episode of The Office or Gilmore Girls that I’ve already seen 1,352 times. More sprints, more writing. I’m super productive during this stretch, fueled by a full stomach and caffeine. If I hit a writing rut, I either take steps to fix it or decide to move on to something else. By this time Brooks is bored, so I either take him for another walk or out back to chase tennis balls in the yard. He could do this all day. I cannot. After we come back in, I find a good stopping place and wrap up whatever I was last working on. Then I start wrapping up the day by answering emails, occasionally setting up podcast guest interviews (for myself, I don’t have a podcast), and hopping into some forums to chat. About this time I switch from sitting to standing (thanks convertible desk) since I don’t need intense focus for this type of work. I usually check out r/freelancewriters on Reddit, Inbound.org, and the Copywriter Club group on Facebook. These are great places to learn, talk to fellow writers, and to keep tabs on what’s happening within my niche. Also more Twitter. I think to myself: IT’S SO QUIET IN HERE. Have I said a word out loud today? No. No I haven’t. I’ll finally turn on some music to break the silence. Today it’s the new HAIM album on Spotify. Now I’m working and dancing. Around 4:15 I roll out the yoga mat and do about 15-20 minutes of stretches. For a while I was following videos, but now I just do my own thing to music. Last winter I got pretty sedentary and was SO STIFF all the time. My back hurt, I was miserable, it sucked. Hence making this a priority. I do one final sweep of my email, make my to-do list for tomorrow, and end the day. Now I wanna hear what your writing routine is like. If you have a post like this one, send it my way. I love reading these.